My fascination grew when I read online about Hemang Agrawal’s textile journey after seeing his dazzling collection at Vayu, an upmarket concept store. Particularly how as a young lad from Baneras after studying at NIFT, Mumbai, thought it best to give up his scholarship for Masters in Fashion at Nottingham Trent University to go back home and make something of his textile roots(father had a saree business). Apparently this life altering decision was taken after listening to Padma Shri Rahul Jain‘s talk on Safavid, Persian and Mughal drawloom patterned textiles; wherein he explained in depth the sophistication and innovation of Benarasi textiles of the past several centuries. Later this foremost textile historian and revivalist of India became Hemang‘s guide and guru. This American singer echoed my thoughts eons ago since cotton seems to have a similar effect on many. A delicate, shiny, complex weave of superior quality is what defines Indian cotton; so when it was exported during the British Raj, the world was left wonderstruck! Its virtues of being light as the air, strong as the sun, flowing like the wind, soft as dew, opaque as smoke, cool as the moonlight and subtle as running water is what inspired Raw Mango for the summer of 2015. As a marketing consultant for upcoming brands I had approached Indian August initially to retail a brand. After visiting the store I decided to feature it, as it proudly spelt ‘Made in India’ in everything it displayed; creating a well required niche for itself in Delhi’s satellite town- Noida. I was visiting my favourite store Kashmir Loom in Nizammuddin East, New Delhi, when I came across Malvika Singh’s first collection of Maheshwari sarees in tussar and regular silk, cotton and tissue. 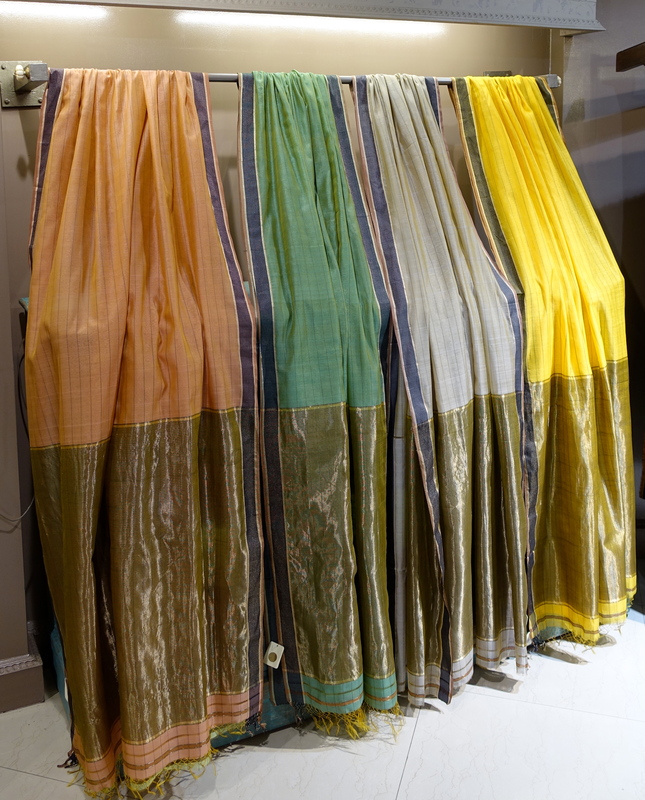 Their checks and horizontal stripes with varied thickness and size looked resplendent when highlighted with silver, gold and copper judiciously on the body, border or patli pleat. The metallics seemed to have passionately held together the original Indian palette e.g. 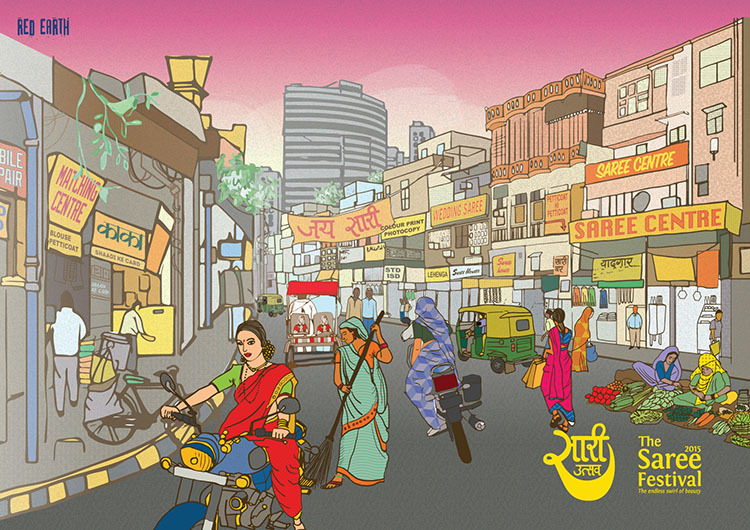 neem (bright green), baigani (purple), pyaazi (onion pink), aasmaani (sky blue), sindoori (vermilion red), haldi (yellow ochre), zafraani (bright orange-red), kantha, neel (indigo), chandani (milky white) and amavasya (black). I’ve always loved the rituals of a festival, could be of any religion. They are reasons for me to make merry more often than not. 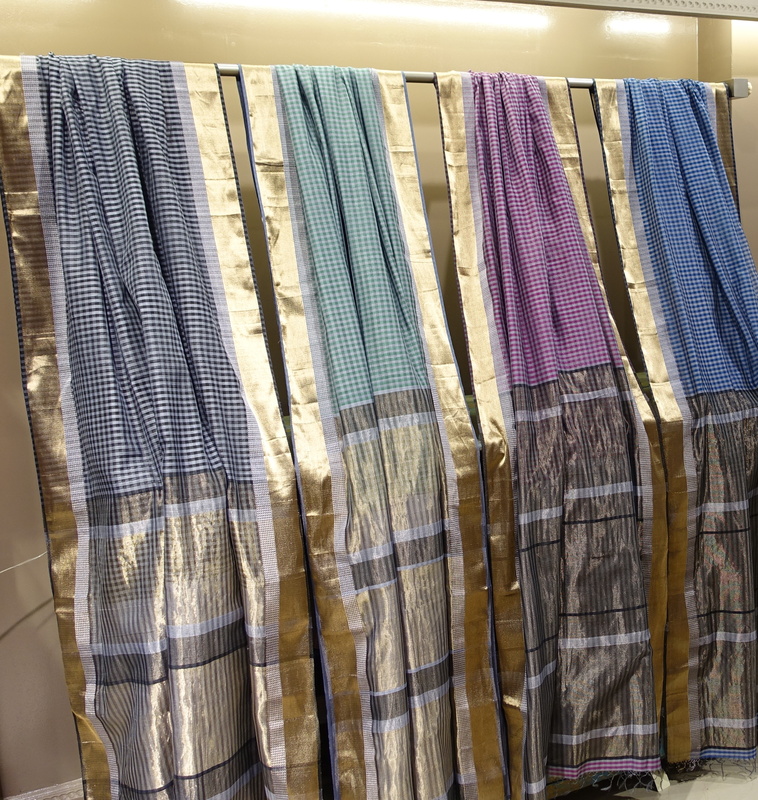 So when I chanced upon Jyoti Reddy’s contemporary yet traditional saris during the sari exhibition curated by the Crafts Council of India, a month and half ago, I mentally put together my lookbook for all seasons and reasons.